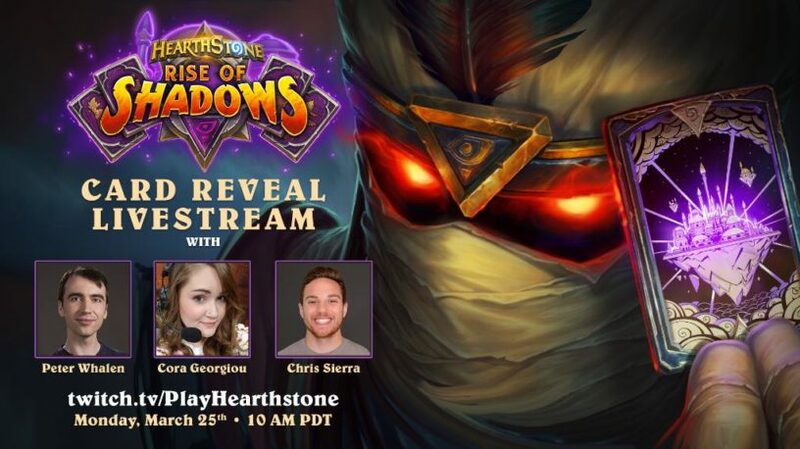 Home » News » First Rise of Shadows Card Reveal Stream Date & Time! The first reveal stream of the Rise of Shadows expansion for Hearthstone has been announced! It's just about time for the first big reveal livestream of cards from the Rise of Shadows expansion! This time we'll be watching Peter Whalen (Hearthstone Game Designer), Cora Georgiou (Commentator), and Chris Sierra (Hearthstone Community Manager) unveil some new cards and discuss some of what went into creating them. You'll be able to watch the livestream on Monday, March 25th, 2019! It usually goes on for about an hour, and we generally get a chance to see ten new cards from the expansion. This also kicks off the start of "reveal season" where a bunch of community members will start revealing cards throughout the day. You can watch the stream on Twitch! We'll be updating our card spoiler list with all of the revealed cards, and you can learn more about the expansion with our guide.